Private cloud attribute enables on-demand self service mechanism which means peripherals including memory, network, computer and resources should be available from a portal /website so finally whenever anyone wants to access private cloud service they can access it. So anyone is going to access such services does not require any intervention from cloud service provider. Another aspect of private cloud is- it should be available throughout multiple devices like smartphone, PC, laptops, tablet/tab and any other device available in the market. 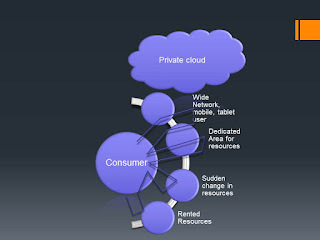 Dedicated area for Resource - is another aspect of private clouding, if someone is going to provide you private cloud services then it should provide you dedicated area for resources where computer, network, memory. Disk /tap should be allocated to consumers from shared area. Another aspect of private cloud id it should have tendency to change its position from utilization if someone is using resources from private cloud then consumer should be able to reduce its resources as per requirement. Tendency to release or use resources on demand should be there for all private cloud consumers. One more aspect of private cloud is- it should provide your cloud services as it has been used – means whatever you have used you pay for it, if consumer has used some resources then they should be bill for such resources. These recourses utilization is monitored by cloud services provider via policy and its billing should be transparent to consumer and providers. Private cloud provides changeable, dedicated area of resources that consumer of cloud services can access through self -services mechanism in such environment where all that is dedicated to your organization.